For Filipinos Christmas Season starts as soon as the first day of September hit the calendar. Christmas songs is being aired and christmas decorations are already available in some stores. 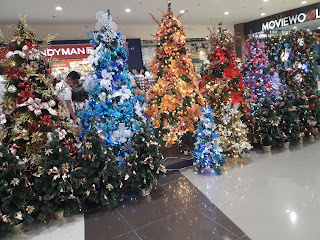 Two weeks ago I saw this Christmas decoration displayed in the mall. I felt excited and giddy knowing that Christmas is just three months away. Christmas is my favorite time of the year. It makes everybody happy. It is also the time of the year where I can shop and by stuff for my family.